In 2009 we were asked to provide a modular management development programme for 30-40 middle and senior managers within Opus Energy. This modular programme is developing as new needs emerge and we were delighted to receive this testimonial. 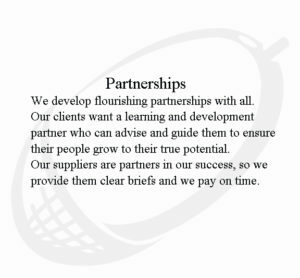 “Kay and Adrian provide a truly flexible service and are responsive to the needs of the business and the people that work within it. They really listen to us and take time to understand what we need as opposed to assuming or dictating what they think our requirements are. They are great at communicating with us and do so through whichever methods best suit us and the situation, whether it is face-to-face, or by phone or email. They have been able to work very quickly on projects and have surprised us (and possibly even themselves!) with how quickly they have been able to take a proposed learning intervention right through from an initial idea to design and successful delivery. They give us regular updates and feedback whilst working on projects for us. The Development Company have provided real value for money and have delivered cost effective solutions for us. In addition to designing and delivering training, they have been generous in sharing their knowledge, resources and ideas with us. They are very approachable and honest and their delivery style is enthusiastic and interactive. The sessions they have delivered for us have been varied in terms of media used, which makes them interesting and memorable they use a great combination of media including large and small group activities, reflection, theories / models, videos and discussions. – Cibele Toledo, Executive Assistant to the C.E.O. Dawn Food Products, Inc.